Even if you've never been a college professor, you could still probably empathize with the anxiety one might feel on the first day. You've prepared your syllabus in painstaking detail, sewn new velvet patches on your tweed jacket, then spent the better part of an hour trimming all excess ear hair (if it sounds like we're lumping all college professors into a horribly-cliched stereotype, of course we are!). You do all that, and then . . . no one shows up. No one. Not the overeager foreign exchange students, not the part-time weed dealers you weren't count on seeing anyway, not the inviting co-eds who may have been inspiration for all aforementioned ear-hair trimming. You stand at the front of the room, gaze across the open rows of chairs while stroking your velvet patches, and you fume. And then you do what every marginally-frustrated person does these days: You find the nearest keyboard and you let it rip. And here's the decidedly-more conciliatory dispatch he sent 15 minutes later. Details on this story are sketchy. 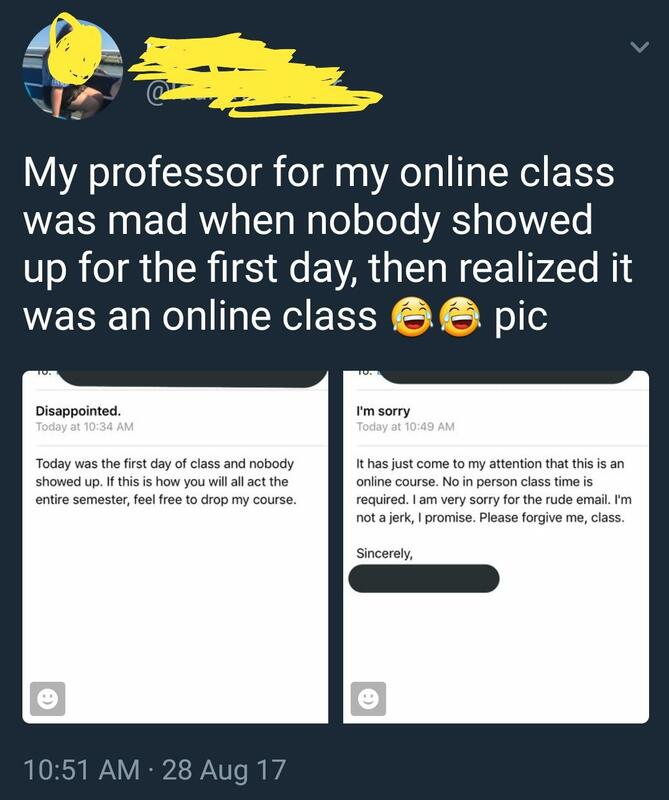 We don't know the name of the professor, the school, or the subject. More disappointing, we don't know what exactly transpired in those 15 minutes, although we're assuming someone -- maybe a colleague, probably a student -- had to tactfully point out that there was no physical space they would be sharing this semester, and that if he wanted to wear a tweed jacket during class and nothing else, he was free to do so.